But it’s exactly what Greg Kelly was told. 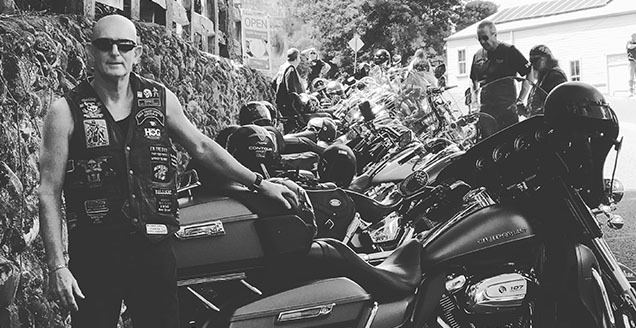 But rather than give into the debilitating condition that affects more than 400-thousand Australians, for the next year Greg is riding his Harley Davidson motorcycle around Australia, New Zealand and the United States. He began his epic journey last weekend from Nerang and spoke with 96five’s Arthur Muhl. Diagnosed with a rarer form of dementia known as Frontotemporal Dementia (FTD) at just 59, Greg, an ex-Financial Services Executive, is one of 25,000 Australians living with younger onset dementia under the age of 65. The diagnosis came as a big shock to Greg and his family, but his determination to never give-up will see him take to his motorbike to raise funds and awareness, for everyone living with this condition. He recently launched his big ride, “Kell’s Ride for The Future”, at Alzheimer’s Australia (Qld)’s A Night of Stars Gala in Brisbane, which raised over $25K to fund ongoing dementia support services around the state. “In my previous life, I was a high achieving individual, working in the financial sector and doing a lot of public speaking for some of the largest organisations in Australia,” said Greg. In addition to the progressive disabilities associated with FTD, being diagnosed as a younger person has significant personal and financial challenges for the entire family. Being younger also makes it harder to access suitable support and care services that may be needed in the future. Along his journey, Greg will be assisted by Janet, his children and a support team vehicle and Friend (Paul). Alzheimer’s Australia is the charity for people with dementia and their families and carers. AS the peak body, it provides advocacy, support services, education and information.